Donald Trump continues to claim that the American presidential election process is rigged. 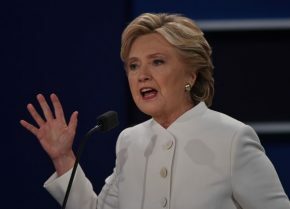 In his final debate with Democratic rival Hillary Clinton last night in Las Vegas, the Republican candidate refused to say if he would accept the results of the November 8th election if Clinton wins the White House. The 90-minute face-off also covered the Supreme Court, immigration, abortion and fitness to be president. Join Jane Brown for post-debate analysis with Conservative pundit Faith Goldy and strategist Mike Van Soelen of Navigator Limited on Zoomer Radio’s Fight Back with Libby Znaimer today from 12:05-12:30pm. The post “I WILL KEEP YOU IN SUSPENSE” SAYS TRUMP ON WHETHER HE WILL ACCEPT ELECTION RESULTS IF HE LOSES appeared first on Zoomer Radio AM740.